Beth Ann & Jessica's Helpful Savings: Shop at Home/Buy.com: 71% off LED Holiday Lights with Free Shipping! 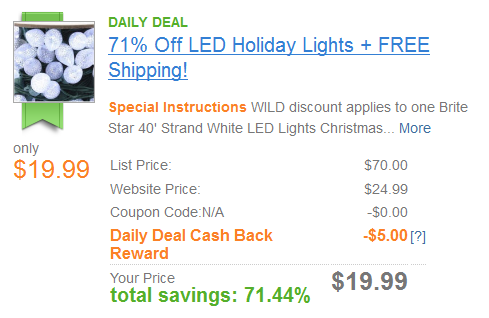 Shop at Home/Buy.com: 71% off LED Holiday Lights with Free Shipping! 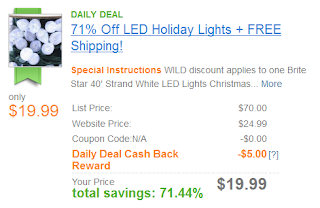 Shop at Home/Buy.com: 71% off LED Holiday Lights with Free Shipping! 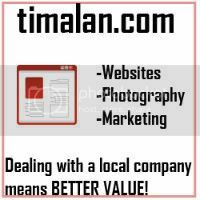 Pay $24.99 and get back $5 cash back. "Brite Star 40' Strand White LED Lights Christmas Wedding Party String In/Outdoor"